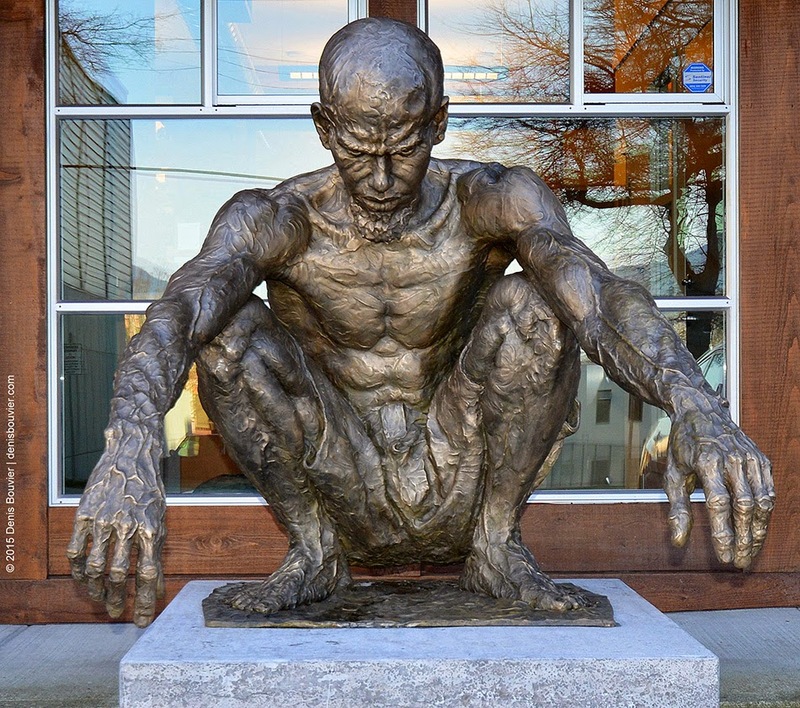 This extraordinary bronze sculpture sits outside the landscape architectural firm of Paul Sangha at 1622 West 7th Ave., Vancouver, about a block west of Le Centre, the Francophone cultural centre. Jeri is at least life-size and very life-like. His veins and musculature are very pronounced. Although he sits calmly in a contemplative squatting position, he exerts a powerful force. The longer you study Jeri, the more animated he appears to be. Although he seems deep in thought, it’s easy to imagine he senses your presence. Jeri was part of Pangea, an exhibit of eight pieces of Stewart’s sculptures, which took place in Vancouver in 2011. Having traveled the world extensively, Stewart became impressed with the nobility of the human spirit especially among the downtrodden. Pangea was the name for the single landmass that later formed all the world’s continents when they drifted apart. His concept is that although different cultures have evolved they still share a commonality like the potential continents that formed Pangea. That commonality is represented in the figures he sculpts which exhibit a primal strength, dignity and pride in spite of oppressive conditions that may have forged their lives. Each sculpture is named after an actual place and is based on photographs of people he encounters on his travels. The figure sculpted becomes a representation of the spirit not only of an individual but personifies the sprit of the local people or even the region itself. Jeri is based on a capoeira dancer in Brazil. It is also the nickname of Jericoaquara, an isolated fishing village in the Brazilian state of Ceará. The area has incredibly beautiful beaches, more recently in its history has attracted tourists, but the surrounding area is environmentally protected. Consequently, the village has no street lights and the streets are filled with sands from nearby dunes. Stewart did have a former life before he decided to devote his life to sculpting full time. After graduating from the Vancouver Film School, he created visual effects, especially those of the “creatures” in many films like that of the lion Aslan in The Chronicles of Narnia, and the prawn-like aliens in District 9. Other films he’s worked on include Reboot, Shrek 2, Harry Potter and Order of Phoenix. Stewart now lives full time in Whistler where he can practice his art and be close to the natural world he loves. Although Jeri is the only sculpture of Stewart’s in Vancouver, you can visit his gallery: James Stewart Sculpture located at 4295 Blackcomb Way, Whistler, BC.